A Sort of Homecoming is a must not only for Anathema fans, but for anyone looking for sublime songwriting. Over the last few years, English troupe Anathema have become a distinguished, affective, and steadfast progressive rock band. Sure, older tracks like “Closer”, “Forgotten Hopes”, and “Are You There?” convey striking emotional truths through engaging melodies, but it wasn’t until the sextet returned in 2010 with We’re Here Because We’re Here that the band truly offered a consistent assortment of thematically linked masterpieces. Packed with luscious arrangements, tragic yet beautiful lyricism, and heavenly harmonies, that album, as well as its successors, saw Anathema traveling down the path they were destined for all along. It makes sense, then, that the group’s newest live LP, A Sort of Homecoming, focuses almost entirely on its post-A Natural Disaster material. An acoustic collection of fifteen gems (spread across two discs), the songs are inherently less boisterous and symphonic than their studio counterparts (or even their appearances on Anathema's last live offering, 2013’s Universal); nevertheless, it’s still an intimate and impassioned journey through Anathema’s astounding recent catalogue. In addition to core members Daniel Cavanagh, Vincent Cavanagh, Lee Douglas, and Jamie Cavanagh, A Sort of Homecoming also features cellist David Wesling and violinist Anna Phoebe on certain sections. The show was recorded at the Liverpool Cathedral on March 7th, 2015; the band began playing in cathedrals last year (in support of its newest opus, Distant Satellites) and felt that a return to its hometown would be the perfect way to conclude the tour. Indeed it is, as the ornate setting and meaningful subtext of the evening permeates every song and audience reaction. The first disc begins with “The Lost Song, Part 2” (from Distant Satellites), which is markedly different than its original incarnation because of its emphasis on acoustic guitar chords instead of piano and strings. In fact, the instrument provides the only accompaniment to the voices of Lee Douglas and Vincent Cavanagh (both of whom do a fantastic job). Naturally, it’s a sparser treatment, but its overpowering solemnity makes it a worthwhile rendition. Luckily, the same holds true for both parts of “Untouchable” (from Weather SystemsWe’re Here Because We’re Here”). While these are certainly not the definitive versions of the songs, they’re still charming and unique enough to appeal. Judging by the deafening cheers that followed “Dreaming Light”, one can assume that the audience agreed. Subsequently, Wesling, Phoebe, and John Douglas come out and help the next two songs from the newest record, “Anathema” and “Ariel”, feel much fuller and more intense. Actually, they sound almost identical to the studio takes (aside from some subtle alterations in the electric guitar tone and strings) and both vocalists sound as fervent and expansive as ever. The first disc concludes with a song from A Natural Disaster, “Electricity”, which Daniel Cavanagh introduces by saying that while he rarely gives himself a chance to sing, he really enjoys performing this one. Unsurprisingly, he does a fantastic job of it, and the way his voice blends with the piano and strings is exquisite. There’s a great sense of dynamics here too, as the band goes almost silent during his whispers (and bursts into orchestral outcry in-between them). Of course, the second disc is equally remarkable, as it begins with “Temporary Peace” (from A Fine Day to Exit), whose melodies and lyrics are easily among the band’s most gorgeous and touching. Expectedly, Vincent Cavanagh sounds as rich and sincere as ever, and the added strings mix well with the subtle percussion and light guitar strums. Really, “Temporary Peace” may still be the best bit of songwriting Anathema has yet produced, and all of its magic is recaptured here. A bit later, “Distant Satellites” is reworked with some audience participation, as clapping stands in for the inventive syncopation of the studio version. Soon after, one of the group’s most awe-inspiring compositions, “Internal Landscapes”, is brought out, and while it doesn’t include the haunting voiceover found on Weather Systems, the essential instrumentation is there. The show ends with two older numbers, “A Natural Disaster” and “Fragile Dreams” (from Alternative 4). As one of the first songs Douglas ever led (it even predates her officially becoming part of the band) “A Natural Disaster” has always been a fantastic showcase for her powerful range and ability to convey romanticism and remorse, and she outdoes herself here. Additionally, the strings collide with the acoustic guitars wonderfully. As for the closing track, it’s obviously more similar to the version on Hindsight than it is to the one on the studio release. Once again, both singers fuse their voices into an angelic amalgam while acoustic guitar arpeggios lead the way. 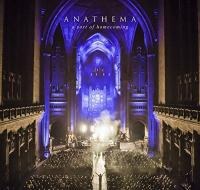 As it concludes, electric guitar lines mimic the melodies; this, coupled with the ovation from the crowd, makes the final moments of A Sort of Homecoming feel like a proper celebration of how far Anathema has come since it began roughly twenty years ago. A Sort of Homecoming is a must-have record not only for fans of Anathema, but for anyone looking for sublime songwriting, warm yet haunting instrumentation, and elegant singing. Yes, its stripped-down approach means that many of the nuances of the official arrangements aren’t there, but it’s precisely this sense of delicate bareness that makes the sequence so charming. In the end, A Sort of Homecoming proves once again that the band are just as captivating on stage as it is in the studio (albeit in different ways), and it serves as another worthy testament to how incredible Anathema are.